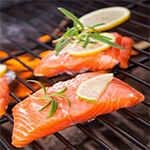 Weight Management : Summer Cook Outs – the Healthier Way! If you live in a place where the snow has finally melted and the winter coats are stored, then it is probably outdoor grilling season! For others of you it may always be “outdoor grilling season!” I know families that grill all year long even with snow on the ground. The benefit of enjoying time with family and friends is immeasurable. It definitely adds to our wellness level emotionally, mentally and physically. We find ourselves more active during those parties, laughing more and having new conversations that stimulate the mind. When you laugh so hard your sides ache that is a wonderful internally exercise program. Games of badminton, swimming, playing catch, walking or bike rides help stimulate metabolism and appetites. Along with all of the good that can come from enjoying summer cook-outs, there are some things that we can do to insure that the foods we choose are really nourishing. Before your put beef, lamb, venison, buffalo, ostrich, chicken, turkey, duck, quail, fish or shellfish on the grill you can reduce the time needed by marinating in the refrigerator the night before. Even marinating for several hours prior to grilling will help reduce the needed grill time. Marinade recipes are easy to find, but you can also purchase ready-to-go marinades in the grocery stores. Coat your protein of choice with marinade and place it in a sealable plastic bag. Shake it up to be sure all sides are covered. Add your condiments to the bag and shake again. Let it sit overnight if possible and if not let it marinate for several hours. This season why not try some of the chicken dogs, turkey brats, veal brats, ostrich sausage, buffalo burgers, and other more unusual animal meats made into your favorite shape! And for vegetarians there are wonderful meatless alternatives in burger and hot dog styles. Next, prepare your vegetables. Mix things up! Use vegetables that you normally do not eat. Perhaps try some vegetables other than corn on the cob – though that one will always work well. Why not slice some eggplant, bell peppers in a variety of colors, or use zucchini sliced lengthwise, a whole head of cauliflower, brussel sprouts, mini bok choy, parsnips, turnips, or other root veggies. You can also marinate vegetables and season them ahead of time. Some people like to put a variety of vegetables in tinfoil boats. Just lay out a piece of tin foil – some people like to line the tinfoil with parchment paper or even unbleached paper bags so the meat or veggies don’t touch the foil, place the food in the center, add butter, extra virgin olive oil, or the new butter-like blends made with flax oil and olive oil. Use iodized sea salt, crushed black pepper, garlic, onions, cumin whatever you enjoy. I sometimes add powdered mustard and soy sauce. Close up the tinfoil boat and place on the top rack! The veggies will steam that way but will have a somewhat smoky flavor. Check them after 15 minutes. Another fun thing to do is to grill up some fruits!! Yes, I did say, “fruits!” So, cut up the water melon, honeydew melon, cantaloupe into round slices about one inch thick. Brush them with extra virgin olive oil and a little seasalt. Place them directly on the grill in order to get the grill marks. Leave there about 3-5 minutes and then turn over. Place in a servicing plate and cover with mozzarella cheese and a sprig of fresh basil. Drizzle on a little Balsamic Vinegar and you are ready to serve! Heat the grill to a temperature of 500 degrees before placing any flesh food on the grill. Sear the open side/skinless first to seal in all of the juices. Cook as recommended by your recipe and then flip over. Cover the grill and check on your main course frequently. Turn as needed. Using foods of various colors is always more appealing so add a fresh salad, or some sprigs of cilantro, watercress, parsley, etc to each plate. Next, be sure you have adequate fluids available at any cook-out. Make some summertime iced teas, lemonades, limeades, fruit punch for the kids. Have plenty of bottled water in ice filled tubs handy. Use pieces of fruit in glasses to make things look festive. For the adults that drink alcoholic beverages service the occasional ice cold beer, or light summer wine is a nice treat. Other non-alcoholic drinks like virgin Daiquiris, Pina Coladas, Tonic and Ginger Ale with lemons, or frozen virgin margaritas are fun. Remember to go easy on alcohol in the heat as you can become dehydrated, and inebriated quickly during warm weather. Whatever your menu choice always have some digestive aids available for those who overindulge. The best choice is AbsorbAid® - 100% plant-based enzyme line. For those who have developed indigestion or heartburn, you can quell that burn quickly by chewing the berry flavored anti-acid/digestive enzyme CHEWS®. Or for those who have overeaten and feel bloated, have gas pains or occasional upset use AbsorbAid ® PLATINUM formula. It will help to fortify your digestive tract and support your immune system. AbsorbAid® PLATINUM is a super digestive aid and it helps to digest all of the cook-out foods like heavier meats with higher fat content along with the many varieties of foods you might place on your plate! Have fun this summer and do it the healthy way!